Plano, IL (May 22, 2017) – While some manufacturers settle on a design and declare good enough, the dedicated engineers at Ameristep have a habit of not leaving well enough alone. When designing and manufacturing the world’s best ground blinds is your core business, you raise the bar with each passing year – taking the best features from past designs while incorporating new ideas that keep hunters (and competing manufacturers) watching with great anticipation. New for 2017, the Spirit Blind is a prime example of Ameristep’s continuous ground blind innovation. Patent-pending organically shaped window openings combine with an all-new silent daisy-chain window closure system to defy the discerning eyes and ears of deer, turkey and other game. The Spirit Blind is designed with covert and highly functional organic window shapes that blend into the natural environment. Their gentle curves eliminate the straight and unnatural lines and angles of traditional blind windows, giving the Spirit Blind – and the hunters concealed inside – a distinct advantage. The competition can’t help but ask, why didn’t I think of that? 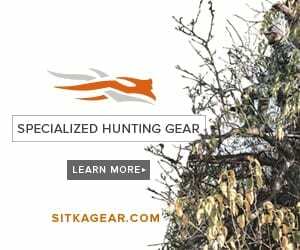 The outer shell of the Spirit is comprised of Ameristep’s proven, proprietary Durashell Plus fabric – a dull, woven polyester material that is non-reflective, lightweight, and makes possible the highest quality camo printing in the industry – something hunters will appreciate when they see how good the Spirit’s Realtree Xtra camo looks. Sewn-in brush pockets above and below the windows make adding natural vegetation from the surrounding terrain quick and easy. Once hidden inside, hunters can easily customize the Spirit’s versatile window openings to control light, viewing angles and shooting angles with complete stealth. The new daisy-chain window curtain closure system is totally silent and operable with a single hand. All window openings are also equipped with replaceable shoot-through mesh camo window screens. A quiet, black Shadow Guard fabric coating on the inside won’t reflect light, affording further concealment to the ghost-like hunter lurking within. Compact storage, durability and ease-of-set-up are regular hallmarks of Ameristep ground blinds, and the new Spirit is no exception. Built on Ameristep’s notoriously strong and reliable Spider Hub frame, its stamped hubs won’t crack like the cast hubs on other brands. Ameristep’s all-new Spirit Blind employs cutting edge design, materials and manufacturing to defeat the keen senses of game animals and help hunters turn into ghosts wherever they hunt. So go ahead and get into the Spirit this hunting season – but be prepared to explain some hefty taxidermy bills to your better half. A leading brand of ground blinds and accessories, Ameristep helps hunters find more success by equipping them with the element of surprise. Our clever concealment products allow hunters to get closer to the action and enjoy more thrilling experiences. Ameristep’s innovative and highly mobile designs give hunters the flexibility to hunt from any location through simplified assemblies and other advanced features that capitalize on the moment. With dozens of patented features and exclusive relationships with leading industry supply partners, Ameristep extends confidence to hunters and helps make great hunts happen. Learn more at www.ameristep.com.